Colostrum is the first milk that sheep (as well as other mammals) produce when they give birth. This first milk is very high in nutrients. However, the most important factor is that it contains numerous antibodies, which protect the new born lambs from diseases. Without these antibodies rather minor diseases can weaken a lamb, make it sick or let it die, even later on and not just immediately after birth. This colostrum must be consumed by the lamb ideally within the first 12 to 18 hours but no later than 24 hours after it was born. There are two reasons for this time limit. Firstly, the ewe stops producing colostrum after about 24 hours, give or take. That means the amount of antibodies in the milk declines rapidly after that time period. Secondly, the lamb is, physiologically speaking, only able to absorb these antibodies for a little more than a day. Antibodies are large proteins. The building blocks of a protein are the amino acids. When proteins are consumed and end up in the stomach, enzymes break down these proteins into these amino acids, which are then absorbed. These enzymes, which also would digest antibodies, are notably absent during the first day of a lamb’s life and therefore the antibodies can be absorbed as a whole. While antibodies also have protective mechanisms that hinder enzymes to digest them, they are mostly still not getting into the blood stream after the stomach starts digesting proteins. What is the practical relevance of this? You can’t delay giving a lamb colostrum if the mother doesn’t have any by another day or two. It must happen on day one. Why would a lamb not get its share of colostrum? The cause could be the ewe. Perhaps she doesn’t have any milk or she has too little for two lambs, perhaps because she is too young or perhaps she had mastitis and one side of the udder is not producing any milk. The other cause could be the lamb itself. It could be too weak to nurse or it could get lost and because of cold weather it may have hypothermia by the time you find it and can no longer nurse. If the ewe is the problem, a substitute should be given. If the lamb is weak or cold, make sure you warm it up first with a heat pad or heat lamp before you give any milk. Cold and weak lambs do not have their physiological functions operating properly and therefore don’t have a fully functioning digestive system. Giving it milk in this condition would kill it. If you raise sheep on a somewhat larger scale, a helpful and in my view necessary tool for feeding lambs that have problems when born is the tube feeder. 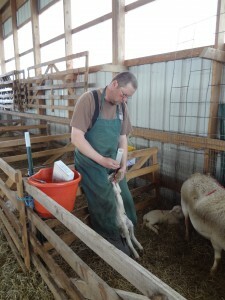 This is the easiest way to make sure that the lamb gets its share of colostrum. It also requires little time and little patience compared to bottle feeding. When you use the tube feeder, make sure that you indeed insert the tube into the stomach and not into the lungs. The lamb will not survive when you drain the milk into the lungs. Also, each feeding should be reduced to about five ounces, less if the lamb is very small. If you give too much colostrum, say upward of eight ounces, at any one feeding with a stomach that doesn’t have the capacity for that much yet, the remainder of the milk will stay in the rumen which has the high probability of killing the lamb. Where do you get your colostrum? If you are lucky you will have another ewe that has lambed at the same time and has plentiful milk that you can milk out five ounces for your problem lamb. You can also milk out some colostrum if you feel there is extra and freeze it. A second option would be to buy a container of colostrum at a farm store to mix with milk replacer when you need it. A third option and the one I want to share with you in detail is the colostrum from cows. A cow’s colostrum can be used as a substitute and I have done so successfully for years. I am lucky to have an organic dairy farmer as a neighbor for a few years now. A few months before lambing I put him on alert that I need a gallon of colostrum. Very often, a dairy cow produces it in excess of what is needed for her own calf. Since the remainder doesn’t go in the bulk tank anyway, I am able to purchase some, usually a gallon. 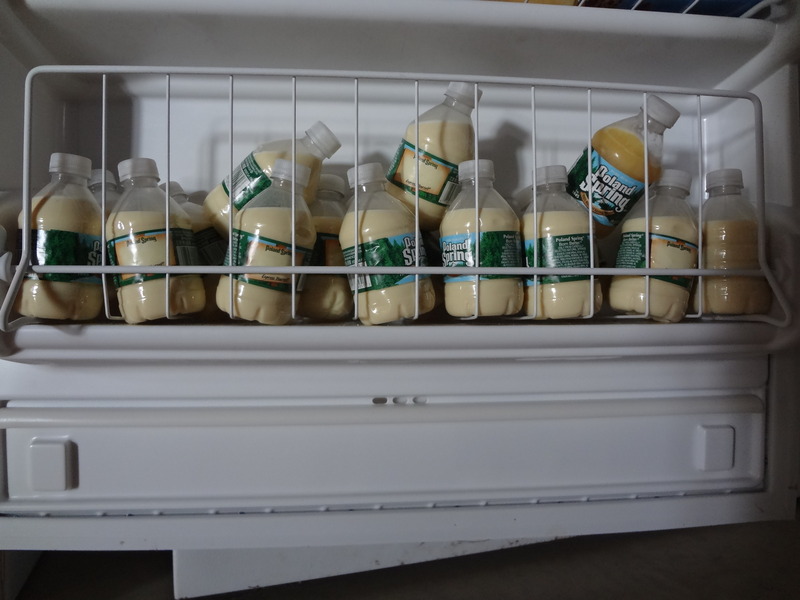 At home I fill the milk in eight-ounce water bottles, leaving a little room for the milk to expand when frozen. I get these small empty bottles from my dentist who offers that size of drink to his customers. I then freeze the colostrum. Each bottle provides me about two feedings for a single lamb or one feeding for a set of twins. When the need arises, I take a bottle and put it in a pot with very warm water. You want to remember that you can’t boil or microwave the milk to defrost it. So a warm water bath will need to do the trick. In addition to my frozen colostrum I have a container of powdered colostrum in the freezer in the event I run out of the one I gleaned from a cow. Also in addition I always have some milk replacer around, which is needed to mix in the powdered colostrum or which is needed if the lamb needs some supplemental feeding beyond day one of its life. While you may have finished lambing this season, you may want to start thinking about where to get some cows’ colostrum for the next season, so that you are ready for the first lambs that need it without having to worry about diseases killing your lamb later on. And if you haven’t done so already, get that tube feeder, will ya? Your article mentions colostrum contains antibodies, how and where does this occur? We are told to give our ewes a CDT vaccine 4 weeks before lambing, it is my understanding that tetanus antibodies do not cross the placental wall Therefore colostrum does not contain tetanus antibodies only when you vaccinate lamb for CDT does tetanus antibodies develope for that lamb. Is my explanation correct? Thanks for reaching out. This article refers to the naturally occurring antibodies, also called immunoglobulins, that are produced by the ewe’s body and provide the lamb with passive immunity for its first few months of life. If you have questions about the CDT vaccine and its use in lambs, I’d recommend getting in touch with the staff at Cornell’s Sheep Program – they’ll be able to provide helpful some insight. Their website is here. Hope this helps!